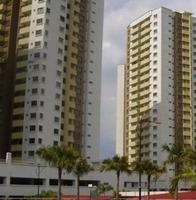 Magna Ville is a high-rise condominium that consists of three 22-storey tower blocks housing a total of 1,074 units. The high-density development has 18 apartment units on each floor comprising 3 bedrooms and 2 bathrooms. Magna Ville’s facilities include a barbeque area, 2 swimming pools, an indoor badminton court, basketball court, multipurpose hall, children’s playground and 2 parking bays for each unit. There is also 24 hours security surveillance and trained security personnel managing the grounds. ** WE ARE BANK's EXCLUSIVE AUCTION SALES MARKETING COORDINATOR. Don't wait! Call Us now for further information of this Property at 1700-81-8668. You may view Magna Ville Profile here.